Racquetball – a new sport for Belize? Racquetball is not a sport that may be very familiar to many Belizeans, but Denise Frank, an avid racquetball player since 1976, is trying to change that. Frank, who played the sport at a professional level in the United States, found, upon moving to Belize, that there are no resources in the country to permit the playing of the sport at a competitive level. But she makes an effort to play racquetball at least three times a week, and promotes the sport wherever she goes. She defends the sport, not only as “the best sport in the world,” but also as a sport for all ages that develops hand and eye coordination and promotes body movement and stretching. Frank, who says she prefers to remain in the background, working from behind the scenes, is trying to spark the passion in more people to push for the fast-paced game to be played in Belize. “I want to get more people behind the desire to bring it here so that there’s more push to get the Government to come up with the money to bring it,” she said. 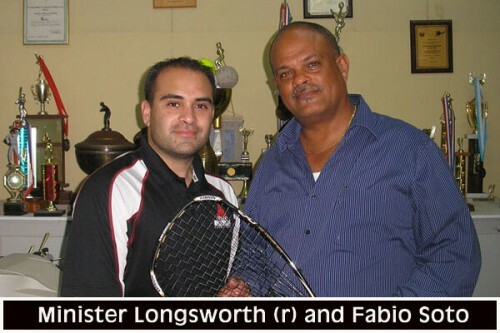 Frank said that there are already international racquetball associations interested in forming connections with teams in Belize and set up tournaments. There are no racquetball courts in Belize but Frank has her eye on the Marion Jones Sports Complex as a potential location for at least two courts to be established. She said she has already approached Minister of State in the Ministry of Education, Youth and Sports Hon. Herman Longsworth about her idea. The only problem is getting the financing for the construction of the courts. She’s requesting the construction of an outdoor court, which will only require a 20 by 40 foot surface wall, two side walls and smooth flooring. A court of that size would not be too expensive, Frank said. Frank arranged a meeting in February this year with Fabio Soto, director of World of Pro Racquetball of Mexico, and Minister Longsworth where they discussed the possibility of creating a partnership in the sport. The meeting went well and the minister had a chance to have a match with Soto. Frank said he enjoyed it. “Fabio said if we could build courts at the Marion Jones, he will guarantee us international tournaments to come here,” she said. “It’s a hugely popular sport. People from everywhere are loving this sport. So he guarantees international play,” she stated. All that is needed to get the project underway is the financial assistance to construct the courts. Frank said she understands that the Marion Jones Sports Complex has already been refinanced, so constructing additional facilities with that money may not be possible. She has been contacting outside sources for funding but needs the public to support the initiative. Frank said she has connected two racquetball companies from the United States — E-Force and Ektalon — to provide support in the form of sporting equipment should the sport be approved. The only materials players will need to provide for themselves are their tennis shoes and eye goggles, she said. Now for a quick lesson in racquetball: The sport is played with a very light rubber ball in an indoor or outdoor court. A stringed racquetball racquet is used to hit the ball back and forth. No net is used in the sport; the walls, floor and ceiling of the court serve as the playing surfaces. As is the case in volleyball, in racquetball the plays begin with serves. You win points by hitting the ball in such a way that your opponent can’t get to it before it bounces twice. Points are scored by the serving player or team and matches are completed in a best of three games series. The point is to score up to 15 points before your opponent. A game can be played with two or more players and matches can be played by single or double players, or “cut throat”, which is one player against two others.